The 1st period couldn't have gone any worse for the Pittsburgh Penguins. The 2nd period couldn't have gone any better. After digging themselves an early 3-0 hole, the Pens roared back in the 2nd period to take a 4-3 lead. A 3rd period Sabres goal turned the game into a dog fight, but it was Kris Letang and Phil Kessel scoring in the shootout to finalize the 5-4 Pittsburgh win. The thrilling comeback gave the Penguins their 3rd win in a row and their 9th in their last 10, and the two points pull them to just a single point behind the Rangers for 2nd in the Metropolitan Division. It was a bit of a sloppy star to the game, but the Pens managed to settle down and start driving the play into the Buffalo zone. They had a good chance about 7 minutes into the game when Eric Fehr knocked the puck away on the forecheck, and it went straight to Beau Bennett on the goal line. Bennett drove the net, but he was unable to wrap the shot around Chad Johnson's left skate. Carl Hagelin would take a hooking penalty in a board battle against Jake McCabe moments later, and the Sabres would get on the board first during the power play. Matt Murray would stop a Johan Larsson shot from the left circle, but he would kick the rebound out into the slot. Trevor Daley wasn't able to corral the puck or take the man, and Matt Moulson was able to put the puck in the net to make it 1-0 Buffalo. The Pens would get a power play opportunity of their own shortly after when Hudson Fasching was called for hooking Patric Hornqvist. The Pens weren't able to get the puck past Johnson despite a couple chances, but they would get another chance when Matt Cullen drew a holding penalty from Josh Gorges behind the net. Pittsburgh would have trouble gaining the zone through the first half of the man advantage, but a Daley turnover on the blue line led a Buffalo rush the other way. David Legwand's shot would beat Murray five hole and trickle through his legs. Daley would manage to clear the puck away before it crossed the goal line, but it deflected off Phil Kessel's stick and back to the top of the crease, where Ryan O'Reilly was able to slam it home into the open net to give Buffalo the 2-0 lead. The Pens would be able to generate good pressure before the end of the period, but Chris Kunitz and Rasmus Ristolainen would go off for coincidental roughing minors with 1:08 left in the period, and the Sabres would quickly strike again when McCabe got in behind the defense on the 4-on-4 and was able to backhand the puck past Murray. The Penguins would enter the locker room for the first intermission down 3-0 despite having an 18-8 advantage in shots on goal and an 81.6 SACF% at even strength. They were doing enough of the right things in the 1st period, but they were going to need to start getting better results, and they did exactly that in the 2nd period. It started 1:28 into the period when Ben Lovejoy one timed a Bryan Rust pass off Johnson and in to cut the Buffalo lead to 3-1. With just under 6 minutes elapsed in the 2nd, Conor Sheary grabbed the puck from a scrum in the corner and drove the net, beating Johnson stick side to pull the Pens within one goal, 3-2. After spotting Buffalo an early three goal lead, the Penguins stormed back in the blink of an eye and made it a completely different game. The Pens would continue to put the pressure on the Sabres, and Hornqvist nearly tied the game on a turning shot from the slot, but he rang it off the post and it deflected harmlessly away. The Pens would get another power play and a chance to tie the game when Fasching took another hooking penalty, this time against Carl Hagelin, and they nearly pulled even when a Justin Schultz rebound popped out into the slot. Kessel grabbed the rebound, but Brian Gionta managed to get his stick in on him just enough to prevent Kessel from getting off a clean shot. 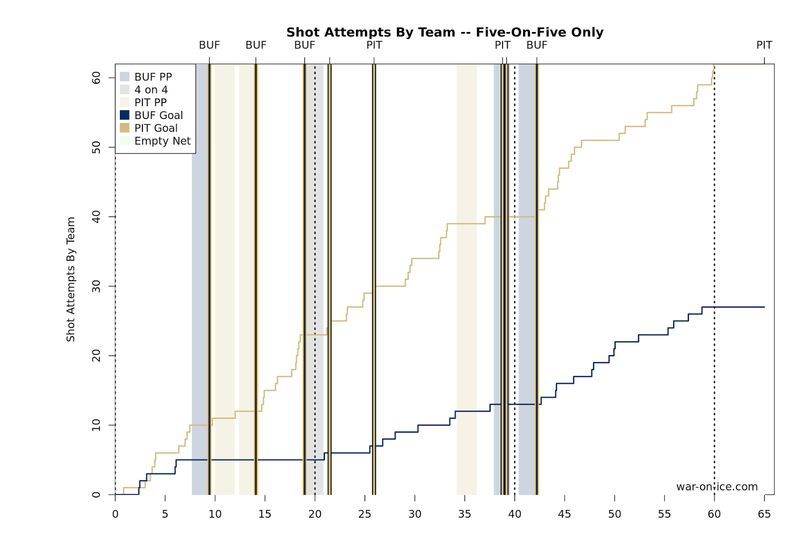 But it would be a Buffalo power play late in the 2nd period that proved to be pivotal. With Eric Fehr in the box for tripping, Matt Cullen and Tom Kuhnhackl managed to get a 2-on-1 rush, and Cullen fed Kuhnhackl cross ice for a one timer that beat Johnson to tie the game 3-3. Seconds later, Johnson played the puck behind the net and attempted to clear it off the glass, but Carl Hagelin was able to block the attempt. He pounced on the loose puck and passed it in front to Nick Bonino, who put the puck in the empty cage to give the Pens a shocking 4-3 lead off two quick shorthanded goals. It was a lead that Pittsburgh would take into the locker room, but like the Pens did in the 2nd period the Sabres would come out strong to start the 3rd. After Ben Lovejoy was called for holding in the opening seconds of the 3rd period, Larsson managed to find Zach Bogosian back door driving the slot, and Bogosian buried it behind Murray to make it 4-4. The Pens would continue pressing for the game winner throughout the third period, but this game was destined to go to OT. And while Pittsburgh controlled the play throughout the extra period, it was Buffalo's talented rookie who nearly took home the victory for the Sabres with less than a minute remaining in overtime. On a faceoff in the Buffalo zone, Sidney Crosby won the puck forward, but the Sabres defense was ready for the move. He tried passing the puck back to Kris Letang in the slot, but the pass didn't connect and it sprung Jack Eichel for a breakaway. He had the game on his stick, but Murray was able to get his left pad on the shot and covered the puck. The game would go to a shootout, and after Sidney Crosby and Ryan O'Reilly traded misses in the first round, Letang put a sneak shot five hole on Johnson to make it 1-0 Pittsburgh. Buffalo missed again as Jack Eichel shot it wide, and Phil Kessel had the opportunity to end things, which he did when he snapped the puck past Johnson's blocker before he had a chance to react. The Penguins have dominated possession recently against pretty much every team they've faced, and tonight was no exception as they completely dominated with a score-adjusted 67.8 CF%. 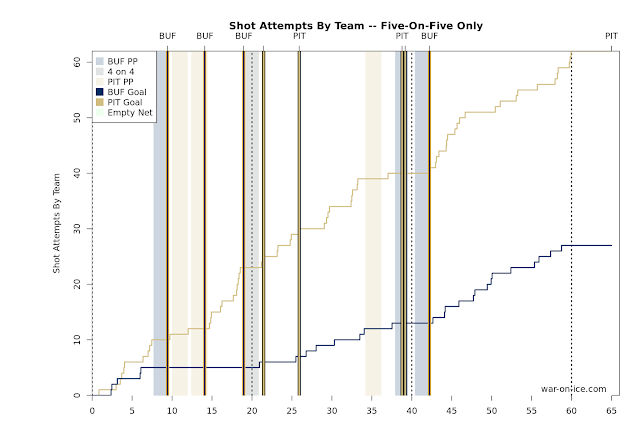 Along with the possession, the Pens didn't allow a single goal at 5-on-5 as the Sabres scored twice on the power play, once on the penalty kill, and once while playing 4-on-4. The Pens will look to keep their hot play going Thursday when they host the Nashville Predators for their final Western Conference tilt of the regular season.